Bentley Motors revealed the production version of the new Azure at the 2005 Frankfurt Motor Show. The luxurious four-seater Azure, which goes on sale in (northern) spring 2006, is the latest in a portfolio of wonderfully desirable 'dropheads' stretching back many decades and reaffirms Bentley's reputation as the manufacturer of the world's most elegant convertibles. 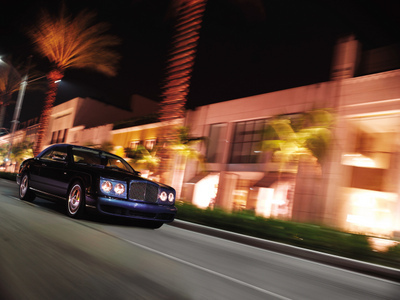 Bentley first hinted that a new Azure might be in the pipeline when it unveiled the glamorous Arnage Drophead Coupé show car at the Los Angeles Motor Show in January 2005. The show car stimulated such interest among Bentley aficionados that the decision was quickly taken to continue its extensive development programme in time for delivery of the first customer cars in Spring 2006. Last month, Bentley announced that the production version of the show car would carry the evocative Azure name. Like its iconic predecessor, which was in production from 1995 to 2002, the new Azure becomes the flagship of the Bentley model range. The design of the new Azure is, first and foremost, unmistakeably Bentley. It shares its face with the current Arnage range and its platform ensures it seats four adults in supreme comfort. But it is also unmistakeably unique. The entire cabin and rear section of the car are newly designed, with a stunning bespoke interior; the objective being to create an opulent and inviting seating area. The complex folding roof on the convertible is operated hydraulically at the touch of a switch: the impressive, three-layer fabric assembly being elegantly stowed beneath the hide-trimmed tonneau in under 30 seconds. The twin-turbocharged V8 engine, double-wishbone suspension and extremely rigid body structure of the Arnage provide a state-of-the-art basis for the new Azure. It is powered by a 450bhp (336Kw) version of the Arnage’s 6.75-litre twin-turbocharged intercooled V8 engine and produces 875Nm (645lb ft) of torque. Details of market availability and pricing will be released nearer the Azure’s on-sale date.